This image of the studio of the celebrated sculptor Sir Francis Chantrey is a portrait conceived not as a physical likeness but as a record of the sculptor’s most celebrated achievements and important relationships. Chantrey worked extensively for King George IV and was knighted by King William IV. He made portrait busts of George III, George IV, William IV and Queen Victoria. The setting is probably based on Chantrey’s studio at 1 Eccleston Street, Pimlico. 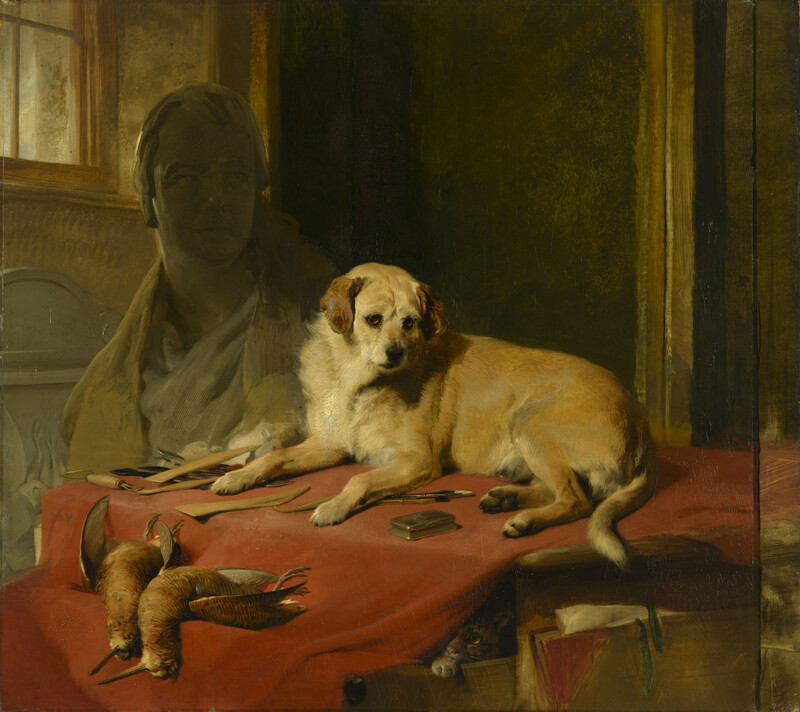 At the centre of the painting the sculptor’s dog, Mustard, sits on his master’s desk, surrounded by his master’s modelling tools. Mustard had been given to Chantrey as a present by Walter Scott in May 1825. The work, later engraved under the title ‘Pen, Brush and Chisel’, was previously exhibited as “‘Mustard’ the son of ‘Pepper.’ Given by the late Sir Walter Scott to Sir Francis Chantrey, R.A.”. The marble relief on the left and the two woodcocks in the foreground commemorate the occasion when Chantrey killed a brace of woodcock with a single shot. A cat peeps out from the desk drawer, whose threatened attack on the birds has put Mustard on alert. Behind the desk is an unfinished bust of Sir Walter Scott. The relationship between Scott and Chantrey was evidently one of mutual admiration, Scott praising Chantrey for producing works that were ‘as like the original subjects as marble can do to flesh & blood’ and Chantrey approaching Scott directly for permission to record his likeness – the only time he could ‘ever recollect having asked a similar favour from any one’. The original plaster bust, from which five recorded marble replicas were made, was completed in 1820, the year in which Scott received his knighthood. The bust was regarded by his contemporaries as one of Chantrey’s finest, capturing likeness, expression and movement in equal measure. In his depiction of the bust, Landseer used his fingers as well as a modelling tool with teeth (particularly evident in the drapery) to manipulate the wet paint and create the illusion of roughened clay. Chantrey commissioned this painting in April 1835 in an amusing letter to Landseer supposedly from Mustard the dog. It is typical of Landseer’s style, combining anatomically exact animals with rich surface texture and a strong, humorous narrative. The painting was exhibited at the Royal Academy of Arts in 1836, where it was admired by Queen Victoria and subsequently presented to her by Lady Chantrey in 1842. Presented to Queen Victoria by Lady Chantrey in 1842.